Everyone loves breakfast cereal. The sweetness mixed with the crunchiness swimming in milk can simply not be missed. But, have you ever actually looked at the nutritional label on a box of breakfast cereal. If you haven’t yet then you really shouldn’t. First of all, you will be astounded by how small the serving size is. That bowl you use for breakfast is probably at least 2 or 3 servings worth. Now, I have mentioned this before but, every so often I go on cereal binges which normally include either Cocoa Krispies or Cocoa Pebbles. I eat the entire box in a day, feel so sick to my stomach and avoid the cereal at all costs for many months or years. 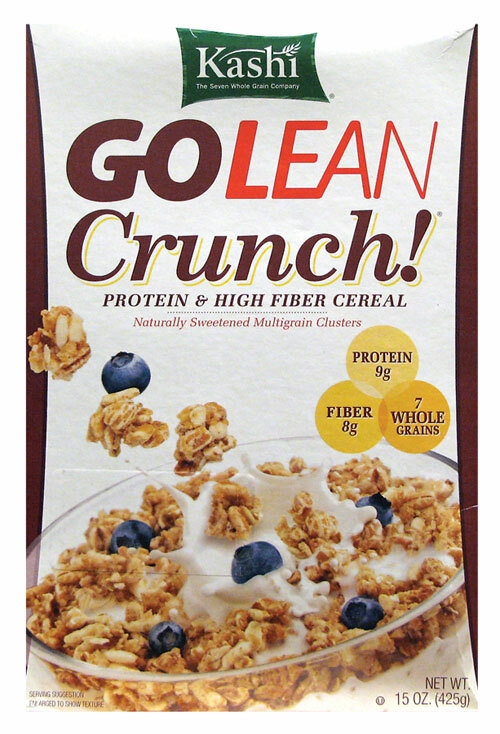 But, there is one cereal that I will buy and really enjoy – Kashi Go Lean Crunch. Kashi Go Lean Crunch is easily my favorite cereal and, get this, I eat it dry without milk. A serving of this cereal is 1 cup which is actually really a lot. For the past two weeks, I have been having ½ cup of Kashi as my morning snack and it has been quite delicious. While this is certainly not the healthiest cereal ever, it is significantly better than most others. It provides whole grains, fiber and as much protein as an egg! As someone looking to really beef up, I’ll take all the protein I can get…hehehe. When you open up the box of cereal and begin to pour it out, you find all different sized pieces. Some of the pieces are pretty large while most of them are small. No matter what the size of the piece, they are all extremely crunchy. This is a major selling point of the cereal to me. The crunchiness provides a fun snack to munch on and really proves that you do not need any milk for this one. Every piece is slightly sweetened to the point where you can taste a little bit but nothing overpowering or excessive. I really enjoy that the Kashi is not very sweet. I prefer being able to taste the natural whole grains, the pieces of oats and the puffed rice. While each element of the cereal on its own is good, the cereal is really not complete until they are all put together. On the larger pieces of Kashi, you receive all 3 put together – these are just delicious. The smaller pieces are normally one of the 3 but, they are just as tasty. 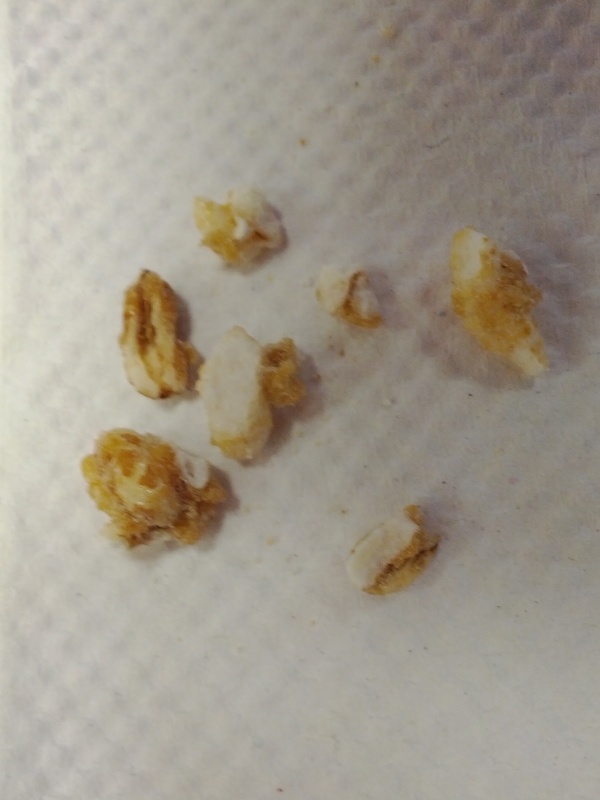 The puffed rice pieces are the least crunchy but, the little put of air that is released when you bite into it, gives it something totally different than the others. 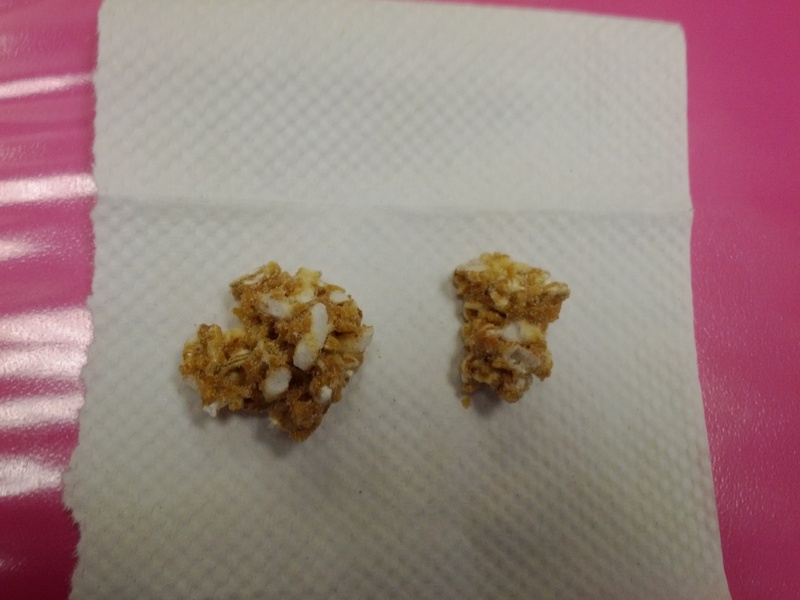 The whole grain and oat pieces are pretty similar and both crunchy. Most of the oat pieces pair themselves up with grain pieces and very rarely do you only get an oat piece. The individual pieces are held together with sugar and spices. The flavor from the sugar and spices is very basic and simple – you do not feel as if you are eating sugar when you eat Kashi. You feel somewhat healthy as you eat the cereal and I take my time while eating it to space out my morning snack as much as possible. My M-F eats are nothing like the food you normally see in Grandma’s Backyard. Kashi Go Lean is a great cereal to buy…when it’s on sale. When it is on sale at Publix, I get a box for $2.50 and it lasts me almost a week and a half of snacks. Every single day is just as good as the next. Every day, my portion provides me with a variety of sized pieces and the ratio is always winning. Plus, since the cereal has fiber & protein, you are actually full when you eat it…not like the sugar stack of Cocoa Krispies or Cocoa Pebbles. The crunchy textures of whole grains, oats and puffed rice, paired with the basic sugar & spice flavors, makes for a lovely final product. Plus, best of all, It’s Got As Much Protein As an Egg! Great…glad to hear someone saw and liked the new look!! !